Alicia will be sewing the Ruffled Cafe Curtain for her guest room. Her fabric choice is Alexander Henry’s June Bug June Blooms in Blue and for the ruffle June Bug June Dot in Black/White. Please note – The pattern is designed to fit the bottom half of a window up to 60″ high x 30″ wide. Kathy chose for the pillow Liz Scott’s Sugar Pop Floral Andrea Pink and for the covered button Dots Dot Dot Dot in Eggplant. 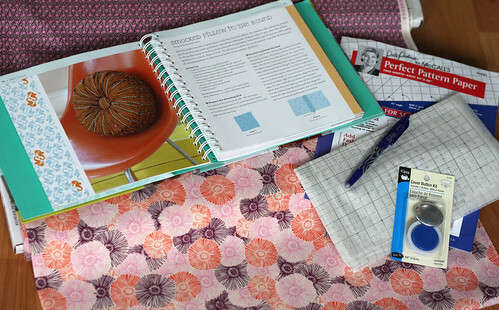 One Yard of Pellon Tru-Grid (available 44/45″, a 1″ graph for scaling up, duplicating or altering patterns). 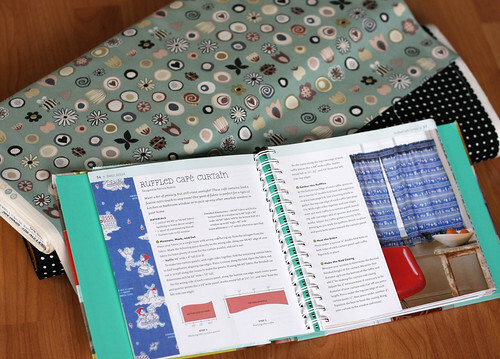 Kathy used McCalls Perfect Pattern Paper which she had on hand – it worked fine as a substitute. One 14″ square pillow that will be turned into a round pillow. Two 1 1/2 (size #60) cloth-covered shank buttons.